tornado valley | WRITE, BABY, WRITE: You can do it! Algebra makes me nervous. Letters mixed with numbers doesn’t seem right to me. I’m not the norm in my town of Huntsville, Alabama -one of the top three cities for science, math and tech grads. Yet, I walk amongst them. Some letter/number combinations are daunting to even the most precise engineer, however. Combos like F4 and F5 strike a different chord, no matter your walk of life in this town. Home of both NASA and the U.S. Army Space and Missile Defense Command, ironically, Huntsville is also targeted as the most tornado-damaged city in the nation. On this day five years ago, we saw some of the worst devastation on April 27, 2011 from not one, but several invasive tornadoes. One formidable F5 traveled on the ground for over 90 miles to wreak its havoc. But you should see our city now. The land is recovering and beauty has been restored. A wasteland is now a park. We have more shelters, more warning systems, better awareness, which translates to future lives saved. We are proud, yet humble. Proud of where we are now, compared to then. And humble for what the future holds for us in terms of tornado activity. We keep building and keep hope alive. God bless those who lost what can’t be rebuilt or restored. May your hope be renewed too. You can read our stories here in Tornado Valley: Huntsville’s Havoc . April 27, 2011, a difficult day for Alabama to forget. Today marks the four year anniversary of the Day of Devastation when 62 tornadoes touched down in our state, leaving nearly 300 dead. I met a lady who was untouched by those storms, but later, found a letter that had blown in through her screened porch door. The postmark and address was from Phil Campbell, AL-a town 75 miles away, and one that was levelled by an F5 tornado on that fateful Wednesday. The letter was nothing much, just some country club dues that someone owed. However, the lady felt she had been sent the letter for a reason, so she drove the 1.5 hr. drive to Phil Campbell to find the addressee. She soon discovered that the person whose name was on the letter died in the F5. The lady was touched in a small, random way. Many Alabama folks were directly touched when the random tornadoes became very personal to them. My thoughts and prayers go out today for all those victims and those still living with loss. God be with you and your families. We haven’t forgotten and we never will. A long time ago, the “M” word meant something good. When we were dating, my now husband used to tease me with the “M” word while dropping to one knee. “Will you m-m-m-make me a sandwich?” My heart fluttered with the almost proposal. Yes, I wanted to marry him, but not so much make him a sandwich. I finally got the “M” word I wanted to hear and we’ve been married almost 25 years…and I’m still making those sandwiches. I am both the marketer and the writer, yet I’m not comfortable with one of these people. At some point, this becomes silly. One neighbor even had to order my book online because I was too timid to take her money and dig into my stash of books (And you know there’s always a giant stash). Thank Heavens Write, Baby, Write is only available in ebook format so readers have no choice but to order online. I temporarily solved that marketing dilemma. Most aspects of marketing are out of my control. Recent tornadoes are to blame for guerilla marketing tactics. Last week, Alabama was slammed with more deadly tornadoes. 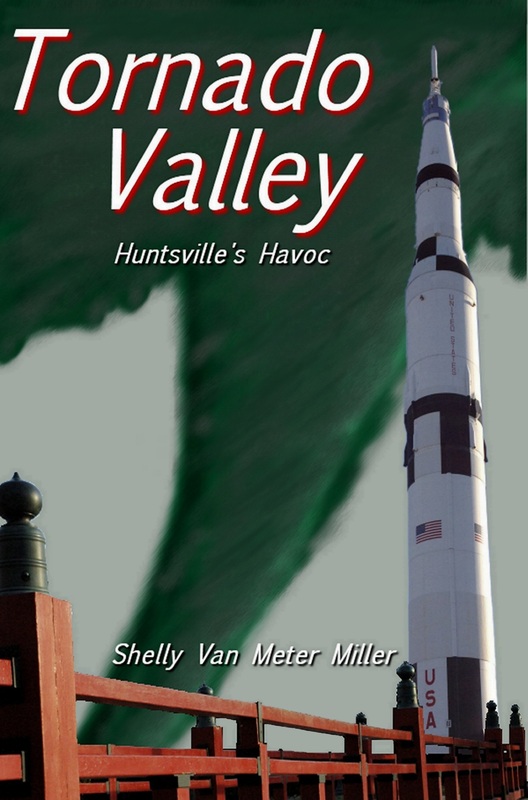 As a result, book sales of Tornado Valley: Huntsville’s Havoc, took off. Of all things, sales depended on the bad weather. For this reason, the ebook is priced as low as it can go during tornado season. I want folks to read the book. Timely advice from those who have survived direct hits from three different tornadoes could save additional lives. That’s worth marketing. If it brings to light the victim’s plight and results in more aid, that’s worth it. And if it means connecting personally with my readers, that’s worth marketing too. Okay, so maybe marketing is not so bad. I’ll think more about that when I m-m-m-make my next ham and cheese sandwich. God bless my readers who have been touched personally by tornado disasters. Whenever quotes were involved, dictation was a double whammy. Do the quotation marks go before or after the period? Why couldn’t the punctuation police just make them go directly underneath? Mere millimeters to the right or left made the entire sentence wrong. Don’t get me started on the metric system. If I could just get through fourth grade, I would never have to take dictation again. Too bad my name starts with the letter s, but surely I could get by in life without ever using quotation marks. But alas, my writing is flat without them. Conversations make characters tick and paragraphs talk. If you want your story to come alive for the reader, the people must speak, and yes, this means quotation marks. Before hives break out from a flood of fourth grade memories, I do three things when letting my characters speak on the page. First, I put quotes around only what they say. Next, when in doubt, I always use a capital letter. Last, I indent whenever a new character speaks. For everything else, we must keep our editors in business. Sometimes writers balk at quoting real live people in writing, and for good reason. Besides punctuation police, there are plagiarism police roaming planet Earth. Again, let the characters speak-especially because they are real. Rarely would you carry a tape recorder around (does anyone ever do this anymore? ), so you wouldn’t write verbatim what the person actually said. Don’t let this stop you from quoting them. In my first book Tornado Valley: Huntsville’s Havoc, I used a disclaimer: “Thank you to … for agreeing to be named as the real people they are, while allowing the author to fictionalize their conversations for the purpose of telling their true stories.” In each case, I received permission from the interviewees, but I wanted the reader to know too. I remembered actual conversations to the best of my ability, but the words were mine. Many words were cut with a lot of dot, dot, dots, because a tornado in your peripheral vision could spark some choice words you may not wish to see in writing. I hope this wasn’t just ‘a tale of fourth grade nothing,’ but that you, too, will strive for livelier stories with more conversations and quotes. Besides, I heard that in fifth grade, they diagram sentences. No wonder I don’t feel smarter than a fifth grader. Well, Here goes… I experienced some good success with a book promo run in the fall with a different book promotion site, but this week on April 4th, I am trying out Author Marketing Club’s featured book of the day, WRITE, BABY, WRITE: You Can Do It!. I will provide an updated review of the Author Marketing Club promo performance. It’s the first time I have used the paid promotion features, but it’s always been a great site for promoting free ebooks! It’s pretty affordable promotion option with a good traffic volume level.